What you do after a hurricane hits your Florida home is just as important as the preparation beforehand. If you remained in your Florida property and your home was hit is more severe than expected, you may still need or want to evacuate the area for safety. Or if you evacuated you may want to wait awhile before returning home. As seen in the wake of previous Florida hurricanes and after Katrina in New Orleans the days and weeks after a hurricane can be both dangerous and uncomfortable. All too often hurricanes increase in strength just before making landfall and what you thought was going to just be a tropical storm or a category 1 hurricane could easily hit as a category 2 or 3 hurricane. Besides the direct property damage to your Florida home, large areas can often be without electricity, gas and clean water for days, weeks and even longer. This can result in shortages of food and supplies as well as dangerous heat without air conditioning. Even in moderate cases hurricanes can lead to a dramatic spike in crime. Hunger and opportunity can lead those who would never have dreamed of committing crimes before to rob others, break into businesses and homes and even commit violent crimes. Certainly not a situation you want to be in. So make sure it is safe and things are as back to normal as possible before returning home or inspecting other Florida properties you may own. When you do return to your property make sure you have a camera to record any damage. Hopefully you will have also taken pictures recently before hand as well to fully document damage or any theft. Be sure to make an inventory if there are any missing items. 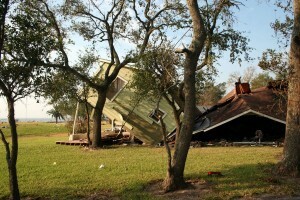 Contact your insurance company to make them immediately aware that your property has suffered damage and contact a hurricane damage claims attorney that can guide you through the process and ensure that you do not make any critical mistakes that can jeopardize receiving full compensation to restore your property completely. You will also want to secure your property as much as possible as it could take some time before receiving your compensation. You may have to go back and forth with your hurricane insurance company and wait on adjusters before being able receive any money. Of course making cosmetic repairs may hurt your claim, however often there are items that will leave your property at risk of further serious damage if left as is. Make sure to secure doors and windows and roofs. Roof leaks in the aftermath of a hurricane can mean continued damage to your property from rain or further storms that can do incredible damage and destroy your property. Pools that have lost surrounding fencing or screened enclosures also need to be secured to avoid hazards for children. You will also want to contact the city and local code enforcement department if any trees have been destroyed or need to be removed as otherwise you could face serious penalties and fines later on even though they were blown over due to a natural disaster. This could lead to expensive permit fees later and even prevent you from selling your Florida property as some residents in Broward county and Fort Lauderdale have discovered in recent years.